The Cambodian Railway began construction between 1930 and 1940. 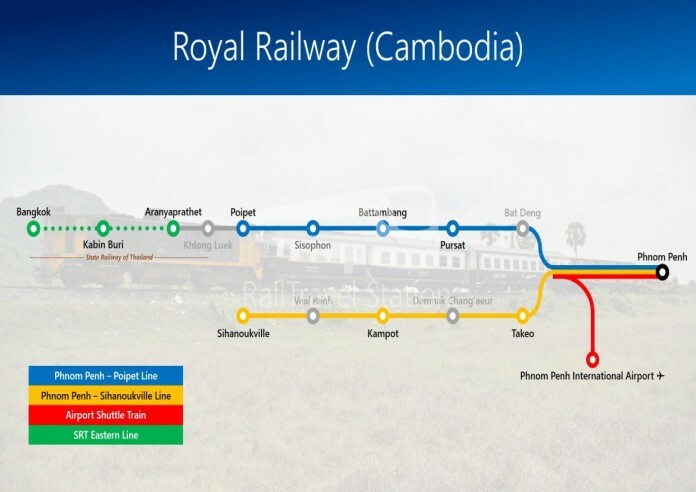 The Cambodia Railway consists of two lines, the Northern Line and the Southern Line with a total length of 650 kilometers. Northern Railway has a length of 386 km from Phnom Penh to Poi​ Pet (Cambodia-Thailand border) and was constructed and functional between 1929 to 1942 during the French colonial period. The Southern Railroad was built between 1960 and 1969 and is a total length of 264 kilometers. Both lines were severely damaged and partially destroyed during the war. Pursat Battambang 134 kmm and Battambang - Phnom Penh 32 km, metal railroad ties, can support 15 ton / axis (launched on July 3, 2018).